Sign up to the E-ELT instrumentation email list to receive information about E-ELT instrumentation developments. Selecting instruments for any telescope is a critical step in making sure that the astronomical community it serves can undertake the scientific projects for which the telescope was designed. ESO has been working with its community of astronomers and instrument builders to develop the sequence in which the instruments planned for the E-ELT will be built and delivered to the Observatory. The result is an exciting programme of powerful facility instruments that can deliver the science cases for the E-ELT. 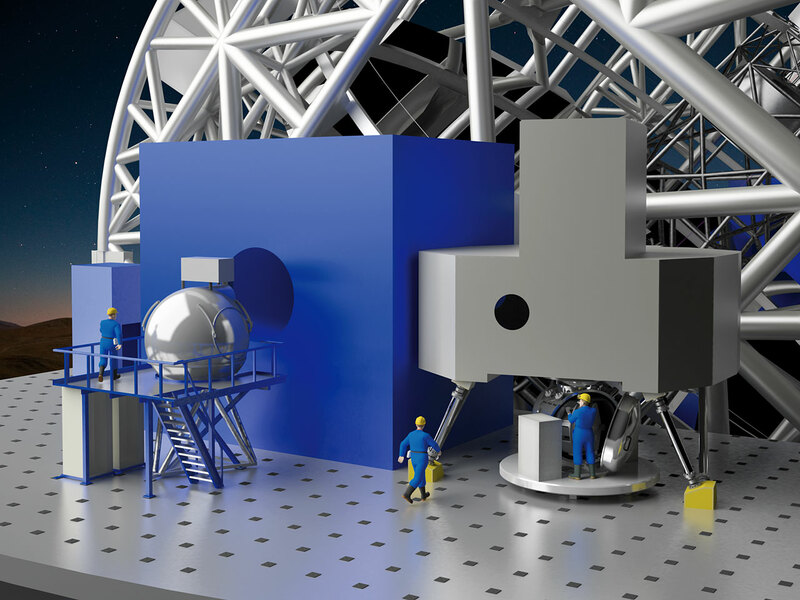 The first steps in developing the instrument plan were taken in 2007 when a plan for studying six instrument and two post-focal adaptive optics module concepts was presented to the ESO Council. Two additional instrument studies were chosen after an open call to the community for additional concepts. By early 2010 all of these Phase A studies had successfully been completed in collaboration with institutes in the ESO community. This summary provides an overview of these. Following recommendations by the E-ELT Science Working Group, the E-ELT Project Science Team, and ESO's Scientific Technical Committee two first-light instruments have been identified: a diffraction-limited near-infrared imager (ELT-CAM) and a single-field near-infrared wide-band integral field spectrograph (ELT-IFU), including the adaptive optics systems required to deliver their science cases. The next three instruments, a mid-infrared imager and spectrometer (ELT-MIDIR), a high resolution spectrometer (ELT-HIRES) and a multi-object spectrometer (ELT-MOS), were considered of equal scientific importance. While the first of these is well defined in terms of its scientific requirements and instrument concept, ESO continues to work with community scientists to confirm the requirements for ELT-HIRES and ELT-MOS. Procurement for all of these instruments will start in 2015. Negotiations are underway with the consortia that will build ELT-IFU (HARMONI), ELT-CAM (MICADO), the MCAO system (MAORY) and ELT-MIDIR (METIS), with the aim of signing agreements for construction for each of these in 2015. A request for letters of interest from the community for the construction of an ELT-MOS and ELT-HIRES will be issued in early 2015, followed by a call for proposals for Phase A studies later that year. The contract for the preliminary design of the LTAO system will also be awarded in 2015. One of the highest scientific priorities for the telescope is to characterise exo-planets and, specifically, to take images of Earth-like planets. Such a giant leap from the capabilities we have today requires significant research into new technologies over several years. Therefore, an ambitious and powerful planetary camera and spectrograph (ELT-PCS) is included in the instrumentation plan, and the research and development for specific components required to build it will start as soon as possible. A final and important aspect of planning for future facilities is to be flexible enough to respond to exciting new ideas or changing priorities. Therefore the plan includes a sixth instrument which is not yet specified, leaving astronomers and instrument builders an opening to introduce innovative new concepts. In total, seven instruments are planned in the schematic shown below. 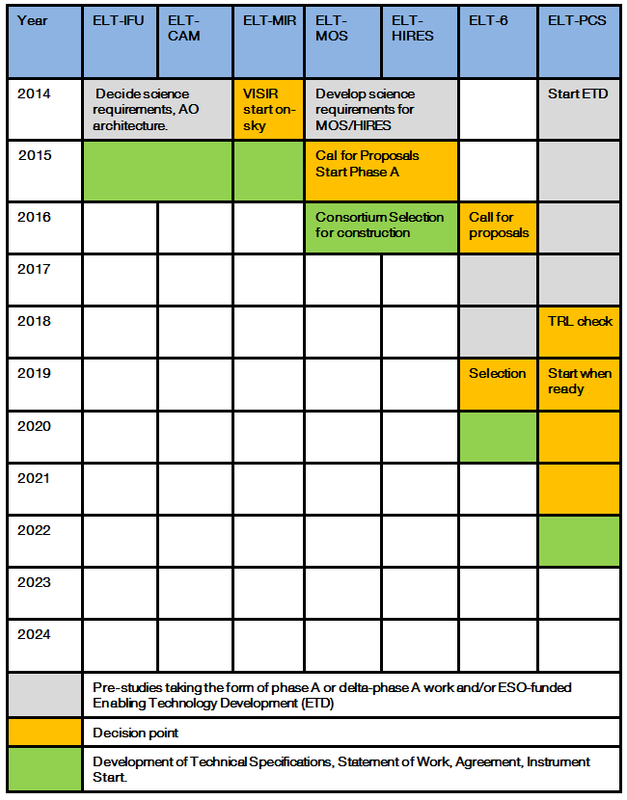 This Roadmap shows the planned dates for initiating competitive Calls for Proposal for Phase A studies of the new, or revised, instrument concepts, as well as for the expected start of construction of the instruments. Ring-fenced funds for instrument construction are included in the construction budget for the E-ELT programme. After the E-ELT construction phase has ended, instruments will be funded by the re-investement funds of the operations budget. ESO also funds an Enabling Technologies Programme that will provide a coherent approach to research and development across all of its Observatories, including the E-ELT. The Roadmap is a snapshot of the current plan, as presented in the Instrumentation Chapter of the E-ELT Construction Proposal. The plan will evolve as the telescope project develops and instruments are selected, ensuring that astronomers from ESO's member states always have access to the powerful instruments that will meet their demanding and changing needs. Contributions by ESO authors that were presented at the SPIE conference in San Diego, June 2010. Many of these papers describe the E-ELT and its instrumentation.